You will find here my favorite beet salad recipes. I love beets for their color. They add not just color but taste too for salad lovers. In addition to that they are nutritious. Beets are good to cook or to eat raw. They are beneficial for your health too. 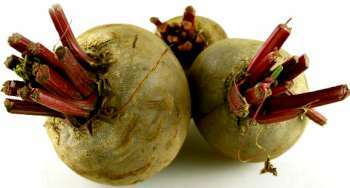 The beetroot recipes given here use steamed beets. You may also use boiled beets. Select tender beets for good taste. They should be round and firm. Beets should be smooth. Wrinkled beets are old. If they have black spots, they are not very fresh. The green leaves of beetroots should be fresh. You may add these leaves too to your salad if you like. Even if you are not adding the leaves, choose the beets which have fresh green leaves. That means the beets are fresh too. Buy and eat beets when they are still fresh. If you are boiling or steaming beets or cooking them in the pressure cooker, you can peel them very easily after cooking. You can also use a vegetable peeler or a knife to peel them before cooking. Enjoy the beet recipes as well as other beetroot recipes given here. You will also find more ways to use beetroots in your meals below.